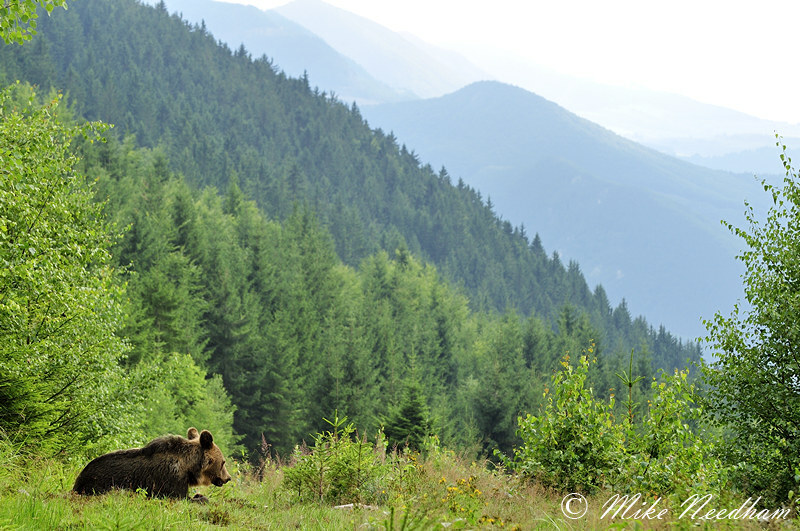 Trip Type: Dedicated photography trip booked through Tatra Photography focusing solely on wild brown bears. Outline Itinerary: Four nights based near to Varin on the edge of the Malá Fatra National Park, 3½ days of hide based photography. Total trip duration of 5 days. Equipment: Nikon D300/MD-10 (x2), Nikkors 70-200/2.8, 200-400/4, Wimberley WH-200 head, Gitzo GT3540XLS, + laptop, readers, duplicate ext. hard drives, etc. Being ‘mountainous’ (more large steep hills than true mountains) the weather was changeable and in the few days spent in the area we experienced storms, heavy rain, clear skies and most other summer conditions in between. One morning was lost to the weather, primarily due to an overnight storm which would have made the tracks treacherous to impassible. However, some of the lighting conditions were as near perfect as you could hope for, the westerly facing hillsides being lit by wonderful golden evening light. The hides were well positioned to take advantage of the evening light in particular and gave access to a variety of different habitats and settings in a relatively small area. The hides themselves were primarily elevated (typically ~2-5m above the ground) but because of the hilly terrain they generally gave good opportunity to shoot at eye level. The construction of the hides however was not generally ideal for photography, being a little cramped with limited room for the use of a tripod or other support types. Some of the ‘hides’ were little more than a bench constructed in a tree, clearly from a hunting orientated heritage more than a photographic one. Certainly not ideal for anyone with a hint of vertigo and offering zero protection from the elements in some instances should the weather turn unkind, others were well covered. That all said, once located in the hides they were reasonably comfortable and you were ignored by the bears provided you were quiet and moved slowly (I’m sure they were aware of my presence). There was also one hide at ground level which gave a lovely intimate view of the bears. 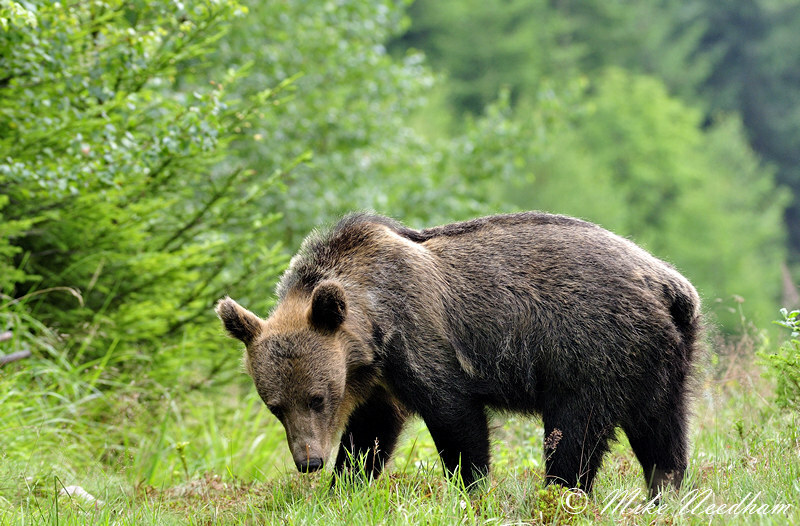 This was the first trip run by Tatra and I’m sure that if they work with the local naturalist who built the hides to help him to develop them to be more suitable to photography and photographers with a wide range of physical abilities, the location has truly great potential for photographing wild bears. The hides were visited on a rota both early in the mornings and each evening, the trip therefore offering a maximum of 7 hide based photography sessions. I missed one session through bad weather and two more due to an altercation with the occupants of a hornet nest in one of the hides which I entered not knowing that it had not been used for several weeks (and sadly not pre-checked prior to use) and had become the hornets home….an ‘uncomfortable’ experience! That left me with just four sessions in the hides and out of these I was able to photograph a single bear on just one occasion (it stayed in front of the hide for 20-30 minutes). Others on the trip were luckier, both with the bears and the hornets, and had between 2 and 4 productive photography sessions, some of which were in beautiful golden evening light. All encounters were in the evenings, no one saw bears in the mornings on this trip. So, lots of photography is not guaranteed but there is a good chance of getting some shots in the allotted time, and a reasonable chance of getting them in amazing light if the weather is kind. The obvious question is how does this location compare to the one in Finland? My answer would be that they don’t, they are so very different. Finland was certainly much more productive, comfortable and suited to photography, but the habitats are totally different and with work there is no reason that the Slovakian hides could not be upgraded to a similar standard. Certainly both are worth a visit but if you only plan to go to one or the other I would, at the moment, recommend Finland. It is better set up for photography (the ‘pro’ hides in particular are brilliant), the bears are more numerous and reliable, and the settings are at least as wild (probably more so, certainly further from population centres etc.). The trip was generally well organised and included flights and half board, the accommodation was very comfortable and the food excellent. Flights were with EasyJet whose hand luggage policy made taking my kit a hassle free experience. We were also accompanied by professional wildlife photographer Craig Jones who was very knowledgeable and eager to share his expertise, he was great company too. Overall a good trip and, had I had the bear encounters enjoyed by most of the group (and missed out on the hornets……) it would have been hard to fault. Considering the encounters that I did have however and the few mediocre photos I returned with, it was just a little disappointing from my perspective.